MARSTON school children have ganged together in a bid to spruce a ‘bleak and neglected’ city thoroughfare as part of a regeneration project. The underpass [pictured] that connects two sides of Old Marston is set to be given a colourful makeover as part of the Murals for Marston project in July. The project is a collaboration between St Nicholas Primary School under the direction of their art co-ordinator Johanna McNulty and two Oxford artists - Miranda Carnegie and Francesca Shakespeare. Explaining the motivation behind the plan to decorate the underpass Friends of St Nicholas School group member Jane Wilson said that they now needed to secure additional funding in order to see the mural completed in time for the summer. She said: “If you’ve recently been through the underpass that connects the two sides of Old Marston, you’ll have noticed that the lovely murals, painted goodness knows how long ago, have mostly disintegrated and flaked away, leaving this vital connecting corridor under the busy, polluted Marston Ferry Road looking and feeling bleak and neglected. The school children showed off a mock-up display for what will be the finished design last week. It will be called ‘On Your Patch’ with an emphasis on local geography, including the River Cherwell, farmland, fields and woodland. The project still needs a cash boost, however, before it can be fully realised. Ms Wilson added: “ The budget for the project is approximately £5000 and there have already been generous grants from the Doris Field Trust, Old Marston Parish Council, Oxford Civic Society and supportive individuals. “However, the project needs £3000 more and may be threatened if this can’t be found soon. An application for some of the sum has been made to the Midland Counties Co-operative Community Fund but we won’t hear until April. “Sadly, the Lottery turned down a bid to its Awards for All fund, partly because the painting is to take place during school hours and so considered in curriculum time. The group has now created a fundraising leaflet in a bid to raise awareness of the project and is appealing for donations and generous individuals to come forward. Since launching the campaign two Marston councillors have offered their support for the project - Mary Clarkson and Mick Haines. Mr Haines said of the scheme: “I think its a really good idea. “At the moment it is a bit bleak there and could certainly use something to tidy it up. A former Marston pub could soon reopen as a Muslim education centre and cafe. Oxford charity The Wilaya Trust has revealed plans to lease Somerset House and transform it into a community hub. But local councillors have raised concerns about the plans, citing multiple attempts by the community to retain the building as a pub since it closed in 2014. Marston has seen a wave of pubs close down in recent years in favour of housing, including The Friar, on the corner of Marston Road and Old Marston Road, The Bricklayers pub, in Church Lane, The Cavalier pub, in Copse Lane, and most recently the Jack Russell, in Salford Road. It leaves only The Red Lion and the Victoria Arms, both in Old Marston. Councillor Mick Haines, who created a petition to save Somerset House from residential development in 2016, said: "I'm disappointed and I think a lot of people are going to be unhappy if this goes ahead because it was the last chance to have a pub in Marston as all the others have closed. "The petition I started had 300 signatures and there have been more since, all fighting to keep it as a pub." Fellow city councillor Mary Clarkson added: "The owner can lease to whoever they like as that is a private business deal but Somerset House was listed as an Asset of Community Value in April 2016 so that means any change of use would require a planning application." She said she had sent details to Oxford City Council enforcement officers so they were aware of the situation. A statement from the trust, which is Muslim-run and states on its website 'draws upon Islamic traditions of education', confirmed it was currently negotiating with the owners of the Marston Road pub but had not yet signed a lease. It added: "The trust would like to reopen the Somerset as a family-friendly café and social space for the local community, with the trust’s offices and a learning-resource centre above." The learning resource centre and its programmes would be open to anyone interested in community-based education. She added: “As an Asset of Community Value, we recognise the local community will be interested in our plans. "Before we submit any planning applications, we will speak to our neighbours, councillors, and community groups, and hold a public meeting at the Marston Scout Hut to seek feedback on our plans." She invited anyone who wanted to receive updates to email info@wilayatrust.org. The trust's website states immediate costs for securing the lease and the first year of operations is £210,000. This will go towards securing the building, hiring a professional educationalist and part-time administrator to begin projects, and launching the café. An artist's impression of how the building would be transformed shows a new glass extension which would house seating for diners. Sarah Mohsin, who lives across the road from the Somerset House and is part of the trust’s finance team, said she believed there was a local need for the facility. She said: "We hope that the Somerset Café will be popular with Marston residents of all ages. "As a mum of three, I’m particularly excited about our plans to improve the garden, as currently there’s nowhere I can have lunch with friends while the children play safely outside." PARTS of a controversial transport plan in Oxford hinge on whether the county council gets the funding it needs to continue. The £12.5m Access to Headington project aims to deliver a number of improvements to roads – but its third phase, due to start this month, was postponed last week. Oxfordshire County Council has said it will now need to wait until the Oxfordshire Growth Board meets next Thursday to see whether it will be handed money to complete the project as planned. The council said it might otherwise need to scale back work to ensure the scheme can come in on budget. Last week the county council said it wanted ‘more certainty over costs, utility diversions and technical issues’ before starting the third phase but did not say that it would be seeking money from the Growth Board. In a written answer to a question by Headington & Quarry councillor Roz Smith published on Tuesday, the council’s cabinet member for environment Yvonne Constance said she is hopeful the project will finish as planned despite the delay. She added that the ‘exact nature’ of the programme will be determined on whether the Growth Board gives the county council money to ‘proceed as planned or view the design to ensure affordability within budget’. The project proposes junction improvements, new cycle lanes and crossings, new pedestrian crossings, changes to on-street parking, new bus lanes and road widening in some places. Work on the third and final phase of Access to Headington had been scheduled to begin on Monday – but was called off on January 16. The council had been preparing to start work on Headley Way, outside the John Radcliffe Hospital, and on the Marsh Lane junction. It hopes that a new start date will be settled by early February. Visitors to the John Radcliffe Hospital had been warned that it could take an hour to get through traffic created by the work. Ms Smith urged a re-think on plans to reintroduce traffic lights on Headley Way by replacing mini roundabouts – and said ploughing on regardless was ‘absolutely crazy’. A city councillor will hand a petition backed by 200 people to the county council tomorrow as he seeks to ramp up his opposition to part of the plan. 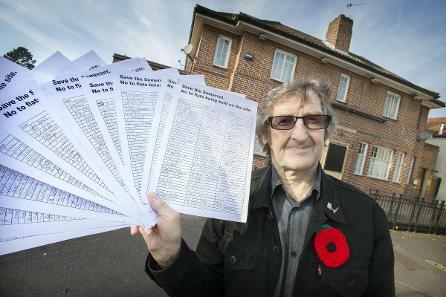 Mick Haines collected the signatures over three days in opposition to another part of the plan, this time for Cherwell Drive in Marston, which seeks to install a set of traffic lights in place of its mini roundabouts. He was initially in favour but changed his mind because he said mini roundabouts installed in Frideswide Square had made motorists’ lives easier since they were built in 2015. Access to Headinton work on The Slade is expected to be finished by mid-February. That includes providing a new bike path. Parking restrictions, including problems with motorists parking on bike paths, will then be enforced. L-R Duncan Hatfield , Cllr Mick Haines and Marston parish council Vice chairman Tony Greenfield. Picture by Richard Cave. A £12.5m roadwork project across Headington has ‘ignored’ the pleas of Marston residents and will only worsen traffic in the area, councillors have warned. Oxfordshire County Council’s Access to Headington project will move on to its next phase on January 22 with nine months of roadworks to begin at the entrance to the John Radcliffe Hospital. The work to improve roads and junctions will be carried out at Headley Way and Cherwell Drive amid warnings from the hospital that motorists should allow two hours to navigate the works and find a parking space. Speaking ahead of the project launch, the chairman of Old Marston Parish Council said the county council had effectively side-lined his ward. Duncan Hatfield said: “Traffic is an issue in Marston already, one of the concerns is the impact at Cherwell Drive because the roads have not been maintained and nothing will be done about that. “There are concerns about how the work could cause more congestion with the traffic lights making the traffic worse and slowing things down. “It is really difficult to see how it is going to impact the Marston area. “They want to improve traffic in and out of the Headington area but Marston has a really severe traffic problem and I think they need to really invest in this because we have got lots of people coming in and out already. City councillor for the area, Mick Haines, also joined calls for more to be done for his ward and said potholes and parking were some of the biggest issues for residents. He said: “When Access to Headington starts here its going to be horrible, most of the residents I have spoken to are against it. He added that he would call on the county council to do more for his ward. Contractors Skanska will begin setting up for the roadworks on Tuesday before work starts on January 22. Oxfordshire County Council was approached for comment. MORE details have been revealed about controversial plans by a charity to turn a Marston pub into an education centre and cafe. The Wilaya Trust announced last month it was in negotiations with the owner of Somerset House to take on the lease for the building to create a community hub. Now the Oxford-based muslim-run charity, which states on its website ‘draws upon Islamic traditions of education’, has confirmed architectural plans are being drawn and would be discussed with the community before any planning application was submitted. Caroline O’Connor, a member of the trust’s management team, explained the first floor, currently residential flats, would be used for a learning resource centre and the trust’s offices. She said: “In addition to the café, the trust plans to run a range of community education programmes at Somerset House. However, Marston city councillors have raised concerns about the plans, citing multiple attempts by the community to retain the building as a pub since it closed in 2014 and its status as an Asset of Community Value. Responding to these concerns, Shehzad Najib, a member of the trust’s management team, said: “We recognise that some residents would have preferred Somerset House to reopen as a pub. “However, the building has sat empty for more than three years, and despite efforts to interest pub companies, none have taken up the lease. She invited anyone who wanted to receive updates to email info@wilayatrust.org. The estimated cost for securing the lease and the first year of operations is £210,000. 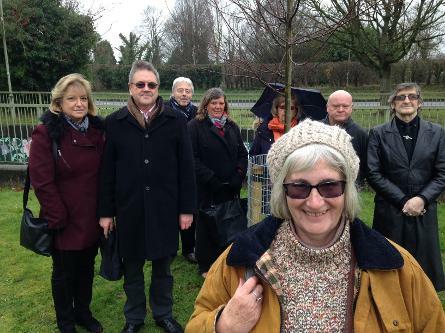 MEMBERS of the Marston community came together to mark the re-planting of a tree celebrating the life of a parish councillor and community champion who died in 2014. The White Willow tree was put up at Mortimer Hall Recreation Ground in December last year to celebrate the life of bellringer for seven decades and Old Marston parish councillor Roy Jones who died in May 2014 aged 78. His widow Catherine Jones joined other community representatives at the Old Marston recreation ground on Saturday afternoon to officially mark the re-planting. The tree was put up for a second time using £300 of Marston councillor Mick Haines' community budget after vandals hacked up the original tree in December 2016. As well as the Willow memorial tree being hacked up and destroyed by a gang of vandals using an axe, a picnic bench and gate were also damaged in the attack at the park, and police said at the time they were investigating, although no arrests were made. Mick Haines said at the ceremony this weekend for the replanting of the tree: "Roy Jones was a Marston parish councillor for some years and he did a brilliant job for the area. "In the time I worked with him he was very dedicated to his job and I am very pleased we are planting this again after it was destroyed by vandals. 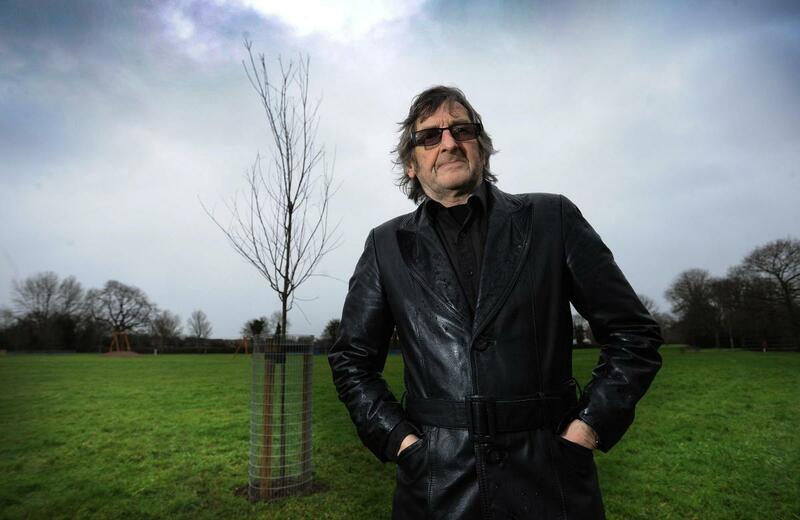 "I hope this time nothing will happen to the tree and it is very important that we keep his memory for the people of Marston. "He was well known and well respected and its important that he is remembered in this way." Mr Haines added that he had been in contact with Police Community Support Officers in light of the previous vandalism and said that the area would be regularly patrolled and the tree maintained by the parish council. He also said that the White Willow tree was chosen because of a poem he wrote while at Magdalen College about the White Willow. His widow Catherine was also present at the ceremony and said: "It is nice to see that the tree is here and you can see it as you go around the corner by the park on the bus, so people can see it. "It wasn't very nice when it was vandalised, I think it was just one of those things that happen, but it is looking healthy now, it is the same sort of tree. "Roy was very pleased to be here and he cared very much about what happened in the community." She added: "If they cut it down again I would like to give the money to something else, something for the community." Roy Jones' prolific work in the community of Marston included being a parish councillor, a chorister and Scout leader. He was a member of Old Marston Parish Council when he died. Mr Jones was also a pharmacist and a prominent member of many bellringing societies and was well known for conducting the bellringing at St Nicholas' Church at Church Lane, Marston. 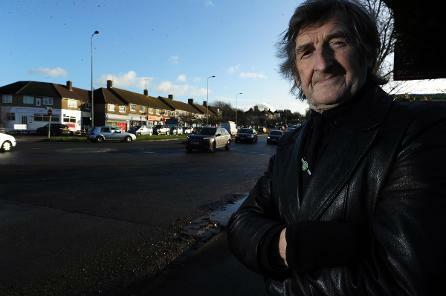 A COUNCILLOR has defended making a U-turn on a change which will see traffic lights replace a set of mini roundabouts. Councillor Mick Haines has been vocal about his opposition about the imminent works at the junctions of Cherwell Drive, Headley Way, Marsh Lane and Marston Road. which forms part of Oxfordshire County Council’s controversial Access to Headington programme. The city councillor for Marston backed a letter also signed by other councillors in the ward published in the Oxford Mail in July 2015. 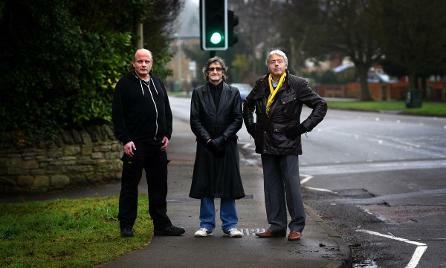 In it, Mr Haines joined current city councillor Mary Clarkson, along with then city councillor Roy Darke and then county councillor Mark Lygo and Old Marston Parish Council’s clerk, Tim Cann, in backing the replacement of the mini-roundabouts and a new pedestrian crossing near the John Radcliffe Hospital as ‘the only two sensible proposals’ in Access to Headington. The project will move into its third phase on January 22 and nine months of roadworks will begin at the entrance of the hospital. But Mr Haines said he had changed his mind on the lights plan after carrying out two traffic surveys over the last year – and noting the impact that mini-roundabouts have had in Oxford city centre in Frideswide Square. He said: “I changed my mind because I did traffic surveys through there and I found that traffic could still keep moving with the roundabouts. “What I really thought about it was that around Frideswide Square when traffic lights to changed to the roundabouts it proved that it could keep (traffic) going. Mr Haines said a petition he started has now been backed by 200 people. The county council’s contractors Skanska will begin preparing for work tomorrow before it gets underway. council had sidelined his ward. He said: “Traffic is an issue in Marston already. One of the concerns is the impact at Cherwell Drive because the roads have not been maintained and nothing will be done about that. The council said work will still go ahead. Spokesman Martin Crabtree said: “We believe that the proposed changes will bring improvements. The programme is designed to provide an attractive alternative to using a car and part of that is making crossing the road safer and easier." AN OXFORD city councillor has slammed an ‘absolutely stupid’ plan which he claims will cause more disruption. Councillor Mick Haines has been angered by Oxfordshire County Council’s proposal to turn a pair of roundabouts on Cherwell Drive into a set of junctions controlled by new sets of traffic lights. Work on the route is set to start in January and run until November, according to the county council’s website. Mr Haines claims traffic will be slowed down permanently, exacerbating problems motorists have struggled with at busy times for years. Independent councillor for Marston, Mr Haines said: “It’s absolutely stupid. I have got nearly 100 signatures written on a petition against (the plan) and I will get a lot more for them. “The people of Marsden aren’t happy about this. The project forms part of the county council’s controversial Access to Headington plan. Overall £12.5m is being spent on infrastructure in an effort to improve roads, roundabouts and traffic lights to cut congestion and encourage more people to cycle. Oxfordshire County Council spokesman Martin Crabtree said the work will still go ahead in Marston despite Mr Haines’ concerns. He said: “We believe that the proposed changes will bring improvements. One of the owners of the Oxford Car Audio shop on Cherwell Drive, Steve Le Masuriem, said he had not had the plan explained to him by the council – and was worried about the possibility of routing traffic past his shop in the opposite way than is currently the case. When Headington residents were shown plans for Access to Headington's phase three work last month, some said they were worried about the impact of the ‘absolutely horrific’ disruption that awaited. 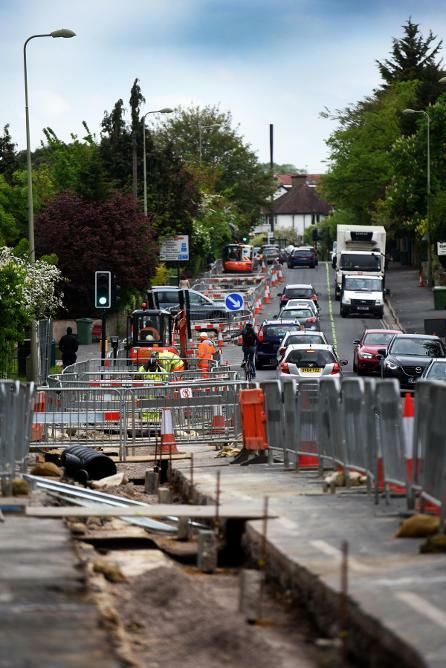 The third phase was initially pencilled in for July but it was delayed by the county council, who said it would have placed an ‘unacceptable’ strain on the city’s wider traffic network. That part of the work will start finally on January 23 and is expected to last for 36 weeks. Severe disruption is expected. Oxford University Hospitals NHS Foundation Trust has already issued a warning this month urging visitors and patients to avoid travelling to appointments by car. THE memories of two Marston community legends will live on after several trees were planted in their name. Bellringer for seven decades and Old Marston parish councillor Roy Jones as well as community champion Billy Munnelly who was heavily involved in Gaelic football and Aunt Sally have both been immortalised with the planting of two white willow trees. Marston councillor Mick Haines was on hand to plant the trees at Croft Road Recreation Ground for Billy Munnelly and Mortimer Hall Recreation Ground for Roy Jones on Wednesday. Mr Haines said: "I think for the area it shows that they appreciated the men, both of them they were really important people to their community. "Roy was especially important for the parish council, I knew him for a short time and we worked together on a few things and he was very important for the area. "Billy was liked by everybody, he was a very well known man, for the whole community and he was really involved in Gaelic football and Aunt Sally." Two further services with a date to be confirmed are set to be held for each of the two men to formally mark the planting.